The Corporate Master in Business Administration (CMBA) makes it possible for professionals to earn a Master's Degree while working full time. The programme has so far attracted students from diverse academic backgrounds and working experiences. Taught by a group of dedicated and qualified lecturers, the programme is innovative, application-oriented and multi-disciplinary. The UNIMAS CMBA programme stands out from other MBA programmes because it retains the best features of the traditional MBA but is combined with contemporary features sought by today's business managers. The CMBA is a master programme by course work over a minimum duration of 18 months, which is an equivalent study of a minimum of 5 semesters. The progrmme is structured into three modules, each defining a specific functional area of study. The modules are divided into Core, Elective and Research. The Core Module provides the foundation of a general business education and a general overview of business management. Students re required to take a total of eight compulsary courses to ensure students have a common level of knowledge in the fundamentals of business. The Elective Module encourages students to explore ideas and to further investigate managerial issues. Students are required to take a total of five courses and are allowed to select any 5 courses from this component to match their interests to career needs. The Research Module is a final component of the CMBA programme, which consists of the Corporate Business Project. It requires students to demonstrate a critical approach to mangement problems and to relate specific issues in order to broader students' management perspectives. 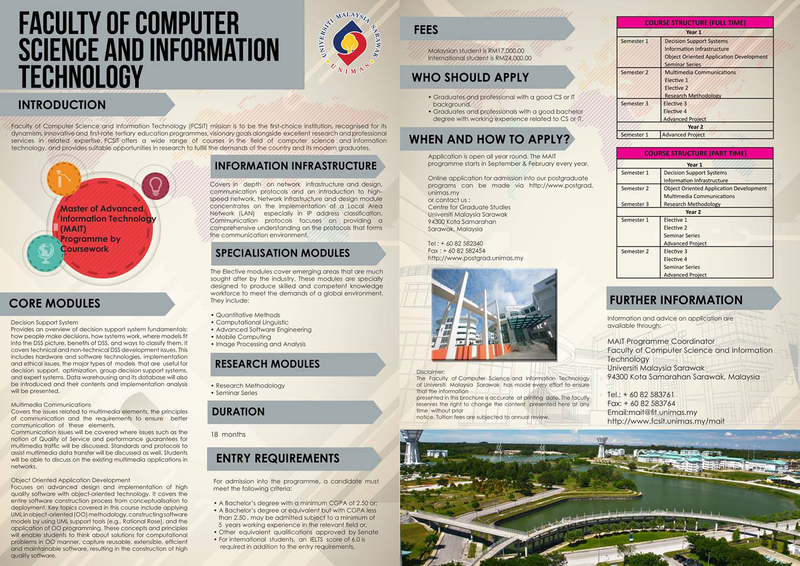 Faculty of Computer Science and Information Technology (FCSIT) mission is to be the first-choice institution, recognised for its dynamism, innovative and first-rate tertiary education programmes, visionary goals alongside excellent research and professional serives in relted expertise, FCSIT offers a wide range of courses in the field of computer science and information technology, and provides suitable opportunities in research to fulfill the demands of the country and its modern graduates. Provides and overview of decision support system fundamentals: how people make decisions, how systems work where models fit into the DSS picture, benefits of DSS, and ways to clasify them. This includes hardware and software technologies, implementation and ethical issues, the major types of models that are useful for decision suport, optimization, group decision support systems, and expert systems. Data warehousing and its database will also be introduced and their contents and implementation analysis will be presented. Covers the issues related to multimedi elements, the principles of communication and the requirements to ensure better communication of these elements. Communication issues will be covered where issues such as notion of Quality of Service and performance gurantees for multimedia traffic will be discussed. Standards and protocols to assist multimedia data transfer will be discussed as well. Students will be able to discuss on the existing multimedia applications in networks. Focuses on advanced design and implementation of high quality software construction process from conceptualisation to deployment. Key topics covered in this course include applying uML in object-oriented (OO) methodology, constructing software models by using UML support tools (e.g. Rational Rose), and the application of OO programming. These concept and principles will enable students to think about solutions for computational problems in OO manner, capture reusable, extenible, efficient and maintainable software, resulting in the constuction of high quality software. The MSc Learning Sciences programme is offered by the Faculty of Cognitive Sciences and Human Development nd is intended for professionals interested in teaching and learning. The Learning Sciences programme is interdisciplinary in nature, combining advanced knowledge and skills in the areas of Cognitive Science, Learning Technology and Learning Sciences research in its curriculum. 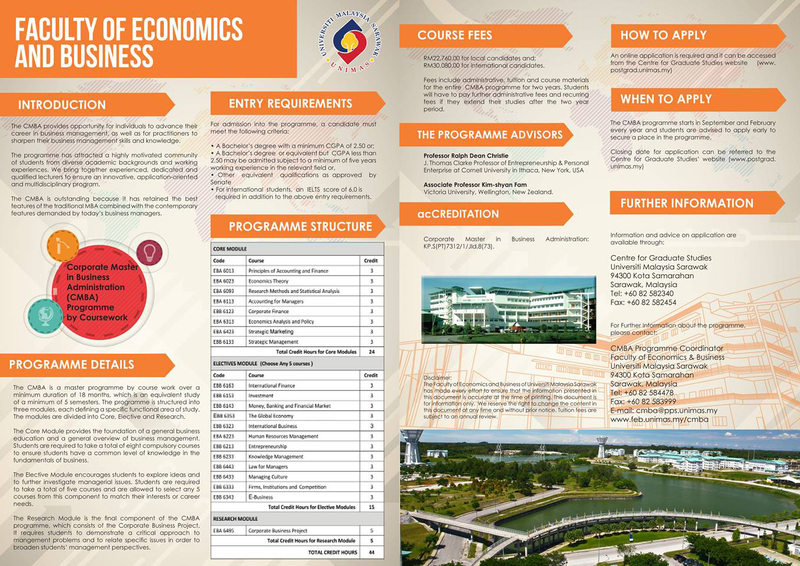 This is the first postgraduate programme in this field to be offered in Malaysia. This programme combines coursework and a research paper. A minumum of 40 credits of study and a final Cumulative Grade Point Average (CGPA) of at least 3.0 required for the award of the Master degree. The complexity of modern day civil engineering in different speciallized field (i.e. water resources, structures, building foundations and soil problems, transportation and traffic problems, the management of construction projects that are environmental-friendly) requires an up-to-date engineering knowledge. Advanced technical know-how, has become a compulsary qualification and essential to all future and practicing engineers. 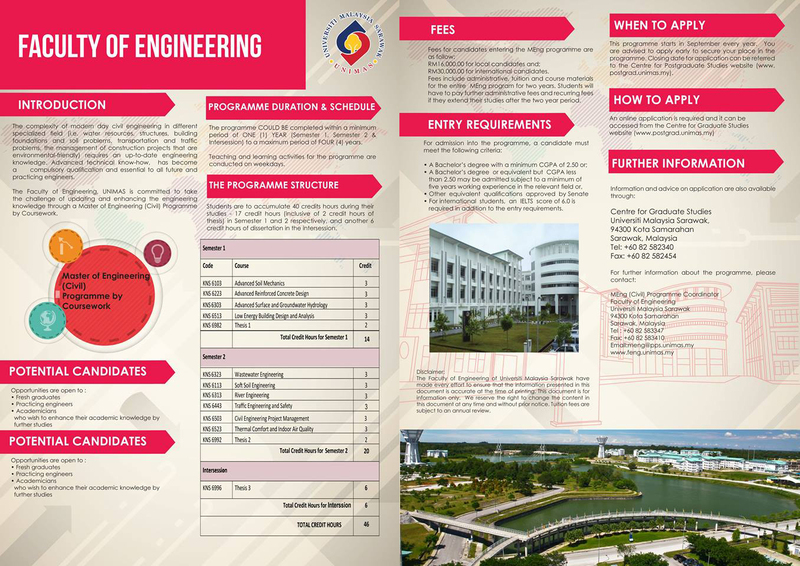 The Faculty of Engineering, UNIMAS is committed to take the challenge of updating and enhancing the engineering knowledge through Master of Engineering (Civil) Programme by Coursework. This M.Sc. 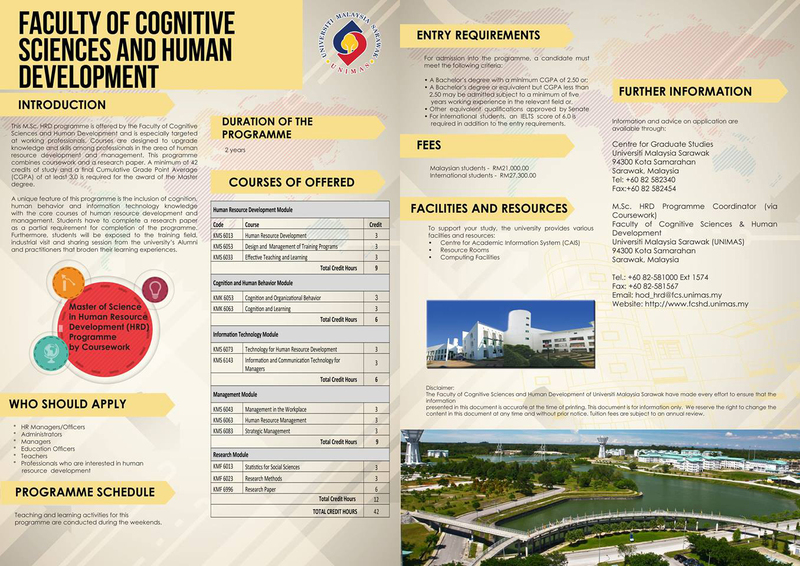 HRD programmeis offered by the Faculty of Cognitive Sciences and Human Development and is especially targeted at working professionals. Courses are designed to upgrade knowledge and skills among professionals in the area of human resource development and management. This programme combines coursework and a research paper. A minimum of 42 credits of study and a final Cumulative Grade Point Average (CGPA) of at least 3.0 is required for the award of the Master degree. 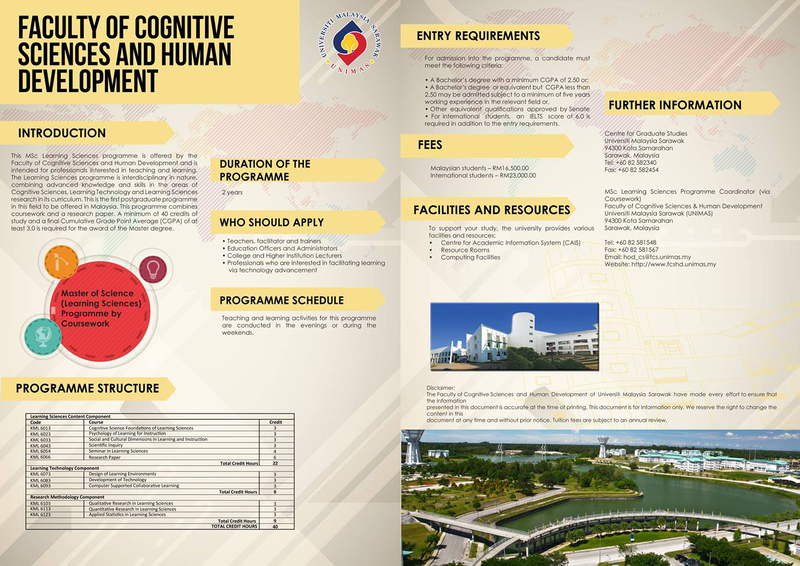 A unique feature of this programme is the inclusion of cognition, human behavior and information technology knowledge with the core courses of human resource development and mangement. Students have to complete a research paper as a partial requirement for completion of the programme. Furthermore, students will be exposed to the training field, industrial visit and sharing session from the university's Alumni and practitioners that broaden their learning experiences. 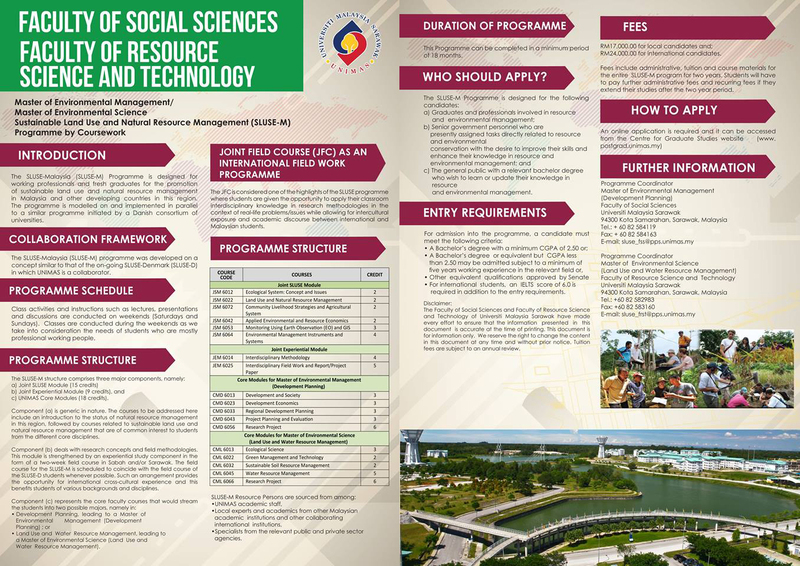 The SLUSE-Malaysia (SLUSE-M) Programme is designed for working professionals and fresh gradutes for the promotion of sustainable land use and natural resource management in Malaysia and other developing countries in this region. The programme is modelled on and implemented in parallel to a similar programme initiated by a Danish consortium of universities.